At the end of yesterday’s post, I mentioned that a fellow writer and mom of an autistic kiddo had contacted me to ask for some help with an opinion piece she’d been asked to write. She sought connections to the some of the autistic people who had been involved in the Twitter takeover of the Autism Speaks hashtags #AutismSpeaks10 and #AutismChampions so that she could include their perspective in her piece. She spoke with the autistic advocates, wrote the piece, then submitted it for publication. The next step didn’t follow as it had every time before. Rather than publish the opinion piece they’d asked her to write, the outlet for whom she wrote it scuttled it. It seems that her opinion wasn’t quite what they expected it to be. I promised her that if she were unable to find a platform to publish her post, I would share it here. The next day, she came back. What’s Wrong with Autism Speaks? Although I have a wonderful 6-year-old autistic son, I’m not thrilled that Autism Speaks is currently celebrating its 10th anniversary. In fact, I’m more excited that there’s been a tremendous Twitter backlash recently as autistic people and their allies speak out against the organization. This fight is nothing new, but the more publicity if gets, the more I find people I know wondering: what’s the big deal? What’s wrong with this (so-called) advocacy organization? Don’t they raise money for genetic research, offer guidance for parents, organize fundraisers, “light towns up blue” to raise autism awareness, and seek to bring together all the “pieces” of the autism puzzle (as the ubiquitous puzzle piece emblem represents)? 1) Autism Speaks’ Co-Founder Suzanne Wright uses a rhetoric of hate and fear to try to bring attention to the organization. She’s demonized autism in a “Call to Action” to policy makers in Washington D.C. and compared autistic children to lepers in a recent speech to the Vatican. The organization also makes terrifying videos about life with autism (which Jess Wilson at Diary of a Mom does a fantastic job of taking to task here). 2) There are no autistic people in decision-making positions (Board of Directors or Leadership) at Autism Speaks (which begs the question of who’s actually speaking for those with autism). Even with these facts in hand, I’ve still heard people say, “so what?” If Autism Speaks is doing some good, isn’t that good enough? Because cultivating a culture of fear about autism and seeking to eradicate future generations of autistic people perpetuates ignorance and encourages fear. Or to paraphrase Jess: demonizing autism dehumanizes our children. And it’s not good enough because it creates despair and frustration, as young autistic poet and writer Emma Zurcher-Long expresses so poignantly here. And it’s not good enough because Autism Speaks keeps doing things to fuel the (quite justified) anger of autistic advocates, like Amy Sequenzia (who’s non-verbal but has a lot to say). So, what should we do now instead of sending money to Autism Speaks? What am I trying to do to be a better advocate for my son and a better mother? Listen to autistic people. Read their words here, here, here, here, and in so many other places. Research neurodiversity, and consider how re-envisioning autism in terms of diversity rather than disease can positively affect all our lives. · Autistic Self-Advocacy Network (ASAN), which provides support, community, and public policy advocacy, by and for people on the autism spectrum. · Autism Network International (ANI) which is an autistic-run self-help and advocacy organization. Every year ANI hosts Autreat, the autism conference designed to be accessible and welcoming to autistic people. · Autism Society of America which works to increase public awareness about the day-to-day issues faced by people on the spectrum, advocates for appropriate services for individuals across the lifespan, and provides the latest information regarding treatment, education, research and advocacy. These may seem like small actions, but I’m certain they’ll cause a lot more good for actual autistic people than tweeting our appreciation for Autism Speaks, screwing in a blue light bulb, or slapping a puzzle piece sticker on the back of our cars. *Author’s note: By saying “autistic people” not “people with autism,” I’m purposefully using the language for which autistic advocates have fought. (There are some excellent thoughts on this subject here and here). Jamie Pacton is a writer, teacher, and disability advocate. But most of all she’s the proud mom of two boys (a nonverbal autistic six year-old and a neurotypical four year-old). Great article, I’m glad it found an outlet. Thank you Jess for giving Jamie and outlet here. And thank you Jamie for sharing your thoughts here. As a mom who is struggling to figure out if my child is on the spectrum or not (needs to be re-evaluated in Nov) and deals with MANY things that point to Autism, I need to hear these pieces and be directed to others who deal with Autism on a daily basis and know what organizations are truly helping. Thank you for sharing your heart and mind here. I used to think that Autism Speaks does not matter to me, after all I live in the UK, and we have a great alternative in the National Autistic Society, the single largest and most influential autism group in the UK. Unlike AS the NAS uses positive language about autism, and encourages people to learn about us and accept us for what we are. The NAS funds education for autism parents to help them better understand their kids, and better parent them in a positive manner. They finance all kinds of services for autistic people, from care homes to training and advocacy services. They have campaigned to have laws brought in that help the autistic community and treat us with respect, laws that require local services to listen to us when making decisions (I’m on our local autism partnership board now for example). The NAS also employs some brilliant autistic people within the organisation, many as advocates for the autistic community. The message of the NAS couldn’t be more opposed to that of AS, their motto being ‘accept difference not indifference’. So why would I care about AS? Because their message is spreading beyond the borders of their home audience. Because people all over the world are being duped by their bleak and horrifying speeches. Because even he pope himself is being targeted for their hateful message, which takes their campaign outside of America and into the wider world. They have made AS the enemy of all autistic people all over the world. And that is a crying shame for all of us. Thank you for sharing this with us. ‘Accept difference not indifference’ is a great motto. I’m so glad you provided Jamie an outlet for her article. It is definitely a ‘must read’. Thank you sharing this for Jamie, Jess! This is the perfect outlet. I agree mostly with what you’ve said, and I’m well aware that Autism Speaks is a very flawed organisation. But when I hear some self-advocates speak, they seem to be exaggerating the issues with it. The “preventation” bit is worrying, but even reading John Elder Robinson’s description, who resigned from the organisation, it appears as though “cure” means helping people with certain aspects of autism or perhaps finding out if “curing” autistic people is possible. But when I hear other self-advocates, they seem to claim that “cure” means “eradicating autistic people”. 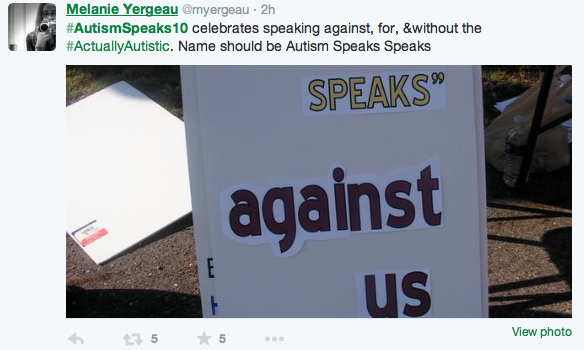 We also don’t actually know if there are autistic people or not on Autism Speaks board, due to privacy laws. And although some autistic people would hate the idea of being “cured”, others would want one. Personally, I’m ambivalent – what kind of cure would it be? How would I know what it did to me? Would I be able to go back to being autistic if I didn’t like it? And ironically, it seems as though Autism Speaks’ messages have become more positive just as actually autistic people are getting their criticisms heard (their recent videos are better, although problematic).